Perhaps the best overview of fuzzy inference systems and how they operate is maintained by Mathworks the producers of Matlab and its Fuzzy Logic Toolbox. This page summarizes some of the basic concepts of FIS covered at by Mathworks. ETAL developed two FIS error models for IPC's use with MBES. One relies on just roughness and slope as an input, whereas the other also includes the MBES-derived TU (total uncertainty) point estimate. ETAL recommends that IPC use the simpler two input FIS we developed, as the TU is overly conservative. Fuzzy inference systems are a method to deal with ambiguity in parameters seen in many real world problems. They are applied in a wide variety of fields with documented applications in environmental impact assessments, geology, engineering and many others (Shepard, R.B. 2005, Ross, T.J., Booker, J.M. et al 2002). The main building blocks of a FIS are fuzzy sets, fuzzy membership functions, fuzzy operation methods, rule implication methods, aggregation methods and defuzzification methods. This section will explore these concepts in more depth. The basic unit to a fuzzy inference system is the fuzzy set. Examples of fuzzy sets are shown in Figure 41 below. The domain or universe of discourse, which is represented by the x-axis, defines all possible values for a variable. The support set, also on the x-axis, is all possible values that can have a degree of membership to the fuzzy set. The y-axis in Figure 41 is the degree of membership to the fuzzy set. A values position in relation to the shape of the fuzzy set determines its degree of membership to that fuzzy set; similar to a function in classical mathematics. There are 4 main shapes that fuzzy sets take on: triangular, trapezoidal, Gaussian bell-shaped and singleton. The slope of the lines that make up the sides of the fuzzy set are the fuzzy membership function and provide a means to determine the degree of membership a value has in that set. Specifically steep slope would represent an exclusive fuzzy set with few values having high membership while a gradual slope is more inclusive and may have many values that have high degrees of membership. For example a triangular shape represents a phenomenon that has one ideal value and depending on the degree of slope of its sides will decrease in degree of membership rapidly with steep slopes or more gradually with more gradual sloping sides. While the presence of a horizontal line at the top of a trapezoid means this membership function has a larger range of values that can have full membership when compared to a triangular membership function. The Gaussian bell-shape is similar to the trapezoidal membership function but has a sharper decline from the high grade membership values. A singleton is a special membership function represented by a vertical line; it has one value that defines its support set and is said to function as a crisp value within a fuzzy logic system (Shepard 2005,Matlab FIS Documentation). These concepts are visually explored in Figure 1. 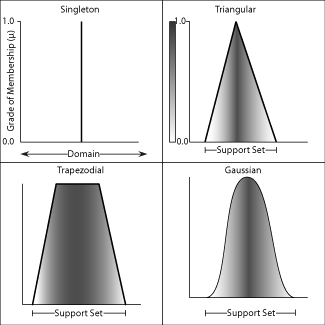 Figure 1– Basic fuzzy sets & membership functions: Singleton, Triangular, Trapezoidal, and Gaussian. The shades of ranging shades of grey represent different degrees of membership to the fuzzy set. The slopes of lines of each shape are the membership functions for each set. Comparing the triangular to trapezodial it the angular nature of the triangle makes it a more exclusive membership function. The examples in Figure 1 represent one fuzzy set however generally, as in this study; a parameter is made up of many groups of fuzzy sets, each with their own support sets, which define the complete domain for the parameter. This concept is shown in Figure 2. This figure also explores the idea that fuzzy sets allow for partial degrees of membership to different fuzzy sets when overlap occurs with another fuzzy set within the same domain. Partial membership is a key feature of fuzzy logic and naturally combines with concepts of ambiguity in parameters. Figure 2– The entire domain of a parameter is classified by 3 fuzzy sets in this figure. Varying shades of gray represent degrees of membership to a particular fuzzy set while the vertically striped regions are areas where overlap in fuzzy sets exists, meaning values occurring in this region have degrees of membership with two fuzzy sets. A basic fuzzy inference system can function to help define a single parameter in more ambiguous terms that can often be more intuitive when classifying complex parameters as is demonstrated in Figure 2. But more frequently a FIS is used to relate multiple parameters that have been classified into fuzzy sets and combine the relationships between these fuzzy sets into final output fuzzy sets. To accomplish this fuzzy operators, implication methods, and aggregation methods are used. Fuzzy operators relate the parameters to one another. The most frequently used fuzzy operators are the Boolean logic operators AND and OR. Fuzzy operators form the first clause in FIS rules statements, known as the antecedent, that establish relationships for how parameters are related. An example antecedent is if surface roughness is medium and slope is low. Implication methods form what is known as the consequent of an FIS rule and close out the antecedent by using basic mathematical functions to create new fuzzy sets for each applicable rule created. There are four main implication methods to apply rules: minimum, product, maximum, and probabilistic. Minimum and product apply to the ‘AND’ operator while maximum and probabilistic apply to the ‘OR’ operator. Minimum simply takes the minimum of the input membership values while the product multiplies the membership values to compute its output. The maximum operator takes the maximum value of the input membership values. The probabilistic method adds the input membership values and from this subtracts the product of the input membership values. Application of the fuzzy operators in combination with rules implication places the parameters into new degrees of memberships to the output fuzzy sets. An example of this is visually explored in Figure 3. Figure 3– In this figure the & fuzzy operator is combined with the minimum implication method to derive a membership to the output uncertainty fuzzy sets. 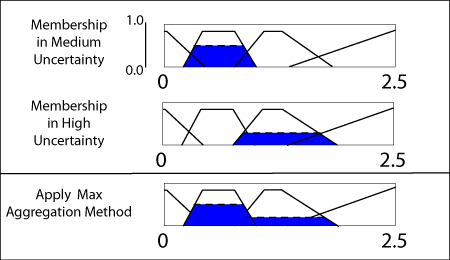 The surface roughness value of 1 foot has membership in two groups medium and high which results in the application of 2 rules, rules 5 and 8, from the FIS. Due to the concept that a particular value can have degrees of membership in multiple fuzzy sets, many FIS rules can apply to the given inputs. To handle this, a FIS uses aggregation methods to combine all fuzzy sets created from the implication methods to create a final consequent fuzzy set. There are three main types: maximum, probabilistic and sum. The maximum method takes the maximum of each degree of membership and combines them. The probabilistic method acts as it did when used as an implication method, it adds all degrees of membership and from this subtracts there product. While the sum adds all degrees of membership to create the final output fuzzy set. This concept is explored in Figure 4. All of these aggregation methods create a range of values that need to be converted into a final single value, this is accomplished through defuzzification. Figure 4 – The max aggregation method is used to combine a membership in two output fuzzy sets. The result is a final value spans the range of both the medium and high groups. A defuzzification method is used to convert from these ranges of values to a single output value. The final step is the conversion of the aggregated fuzzy set into a single value is known as defuzzification. There are 5 main options for defuzzification: centroid, bisector, middle of maximum, largest of maximum, and smallest of maximum. Middle of maximum, largest of maximum and smallest of maximum are all quite similar; they identify the maximum or highest degree of membership in the output fuzzy set and define the final value as the vertical middle value, largest value and smallest value respectively. If there is only maximum within the final output fuzzy set then the middle of maximum, largest of maximum, and smallest of maximum will all defuzzify to the same value. The bisector method outputs the value that if a vertical line were drawn from it would divide the region into two equal area sub-regions . The centroid method is the most widely used defuzzification method. It takes the aggregated fuzzy set and finds a center of mass to calculate the final single value (Shepard 2005, Matlab FIS Documentation). The bisector and centroid methods are quite similar and generally their output is quite similar and can often be the same value. These defuzzification methods and a comparison of their final output are presented in Figure 5. 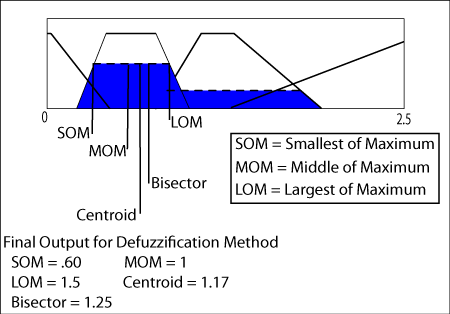 Figure 5 – This figure presents the 5 defuzzification methods smallest of maximum, middle of maximum, largest of maximum, centroid, and bisector. The output value of each method coincides with where the vertical lines intersect the x-axis. Quite a bit of variation is seen between the different methods however the two most commonly used methods centroid and bisector are fairly close in their final output (figure adapted from Matlab Fuzzy Logic Toolkit online documentation). Defuzzification is the final step of using a FIS as the final value is in a single value that can be more easily used rather than a range of values or an ambiguous understanding of a value. The main pieces of a FIS; a fuzzy set, membership functions, fuzzy operators, implication methods, aggregation methods, and defuzzification methods have been presented in this section. To connect all of these concepts in a fluid example all of these pieces are presented in the context of a functioning FIS used in a geomorphic change detection study in Figure 46. The purpose of this FIS is the same as in this paper to provide a structure to quantify the spatial parameters of slope and surface roughness and their influence on the final uncertainty of a surface produced from surveying under these conditions. 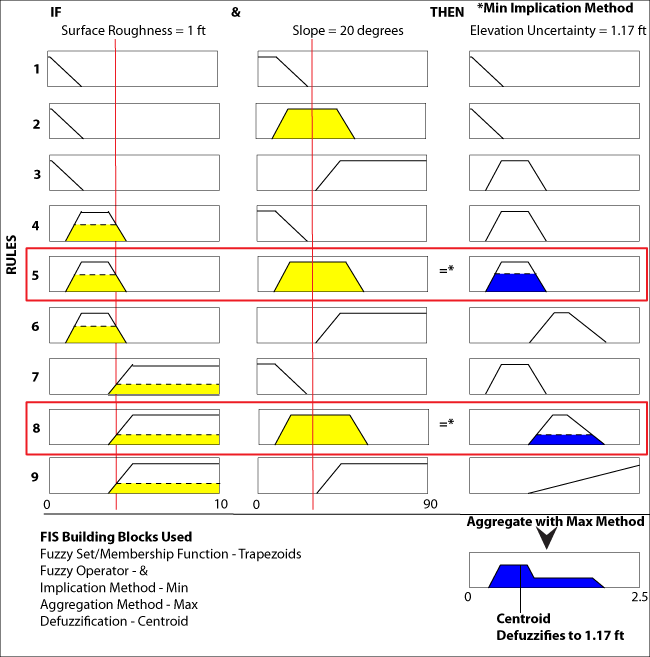 Figure 6– A fully functioning FIS to relate surface roughness and slope and how they influence surface uncertainty in DEMs from a surveyed surface are presented in this figure. Three fuzzy sets each makeup the surface roughness and slope groups while the elevation uncertainty is represented by four fuzzy sets. All rules are shown however only rules 5 and 8 are rules that deal with values that encompass the provided values for both parameters. There are many other membership functions, however these 4 are the most commonly used and these membership functions support many value ranges observed in earth sciences.